Eric Forman originally came to Dallas from Oklahoma City to study the cello at SMU, where from 1989-95 he earned Bachelor's and Master's degrees in music performance. Since then, he has had an active career as a cellist in the Dallas-Fort Worth area, performing as a member of the Dallas Opera Orchestra, as a frequent extra with the Fort Worth Symphony, and in countless and various free-lance engagements. 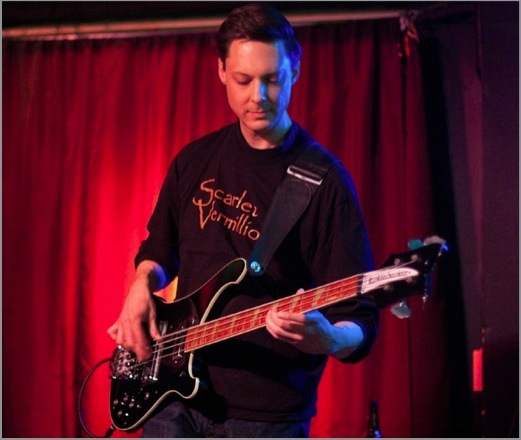 Eric took up the bass guitar at about age 15, which seemed the natural thing to do at the time. As influences, bassists such as Jack Bruce, John Entwistle, Chris Squire, and Geddy Lee seemed particularly cool. Eric had about a year of bass lessons with OKC guitarist Edgar Cruz before taking up classical guitar (upon Edgar's encouragement), which he studied semi-seriously through high school. A casual mixture of classical pieces and popular arrangements was a welcome musical diversion compared with the relatively strict discipline of cello studies. Around the summer of 2006, fellow Dallas Opera musician Norm Stone began quietly seeking recruits for a new musical venture. Though the group's name was yet unchosen, Eric soon found himself re-discovering the joys of bass playing and its peculiar challenges. Blisters became callouses, and before he knew it, he was hooked once again. These days, Eric still loves his old Rickenbacker 4001 as his main bass, but also keeps a 2008 Schecter Elite 5-string in his other holster. A Gallien-Krueger amplifier rounds out the major gear. Also, he rather enjoyed "That '70's Show."